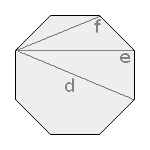 Calculations at a regular octagon, a polygon with 8 vertices. This form is familiar from being used as stop sign. Enter one value and choose the number of decimal places. Then click Calculate. Edge length, diagonals, height, perimeter and radius have the same unit (e.g. meter), the area has this unit squared (e.g. square meter).